Need an easy and filling lunch, dinner, or snack? No Laura, what we actually need is a complicated recipe filled with weird ingredients that our family will hate. Well anyway, my family loves this recipe and I think yours will too. It’s great to throw together at lunchtime and serve with organic corn chips and fresh fruit. Or, you could smear this dip in a whole wheat tortilla and wrap it up to take on the go. You could take it to serve at a party. You could make it for a game night. You could make it for a simple evening meal. You could make it for breakfast. Really? Well, sure, if you really want to. Would the breakfast police actually show up and arrest you for serving bean dip with your morning coffee? Don’t answer that. It’s rhetorical. Mix cream cheese and sour cream in a large bowl. Stir in refried beans and taco seasoning. Spread mixture into a 9×13 inch baking pan. Sprinkle cheese over the top. Bake in a 350° oven for 25-30 minutes or until cheese is melted and bubbly. Serve with organic corn chips and salsa if you like. This looks fantastic! For some reason, I often get “volunteered” to bring nacho dip to parties. People expect the canned nacho cheese (Blech!!) or velveeta/rotel dip, which is what I usually do. But it’s expensive, and full of who-knows-what. I know I could make a healthier version, but I guess I’m too lazy. ; ) This would be a great alternative…and easy! Pinned this for the next party! ??? ?love this as a new lunch idea! (I especially ?? reading your intros and “rhetorical” comments! Made me laugh and made my day ;-) love the blog- thanks, Laura! I must say to truly enjoy your sense of humor….the sarcastic tone is just like mine!! Woohoo Keep up the great blog. Mix it all together & season to taste. Top with cheese and bake until bubbly and gooey. We serve it as burrito filling on the first night and then the boys use the leftovers as nacho dip the next day. This allows this meal to stretch even further! Especially help if you’re feeding a crowd or a bunch of growing boys! 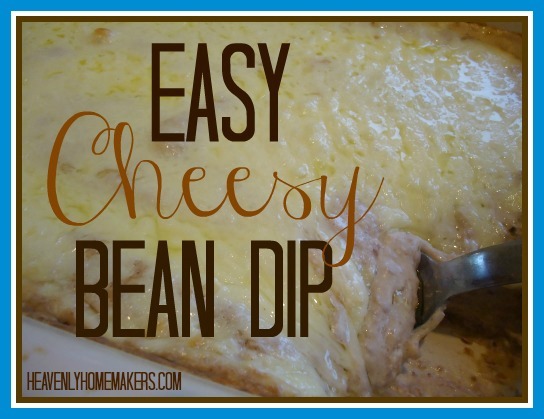 I make a very similar dip to this – love it! Just wanted to add that a few tablespoons of chopped green onions (if your family likes them) is a really good addition. Oh and I love the previous commenter’s version of adding in brown rice!! Sounds like a great meatless & hearty main dish! Have you ever frozen this? I was thinking of making a big batch and doing that. What do you think? I used to make a similar taco bean dip that used bean and bacon soup – this sounds like a healthy substitute – yay! I use a mini crock pot to heat it up and keep it warm – works great. So many of my weekly menus now come from your site. Thanks for all the great recipes! Just wanted to say that we adore this recipe! My 3-year-old requests it often, especially on a tortilla. I’ve also taken it to get-togethers with rave reviews. Everyone is always impressed it’s only 5 ingredients! Thank you so much for all you do! Wow, I just found your site, and I’m loving it!! Any suggestions about buying or making my own whole wheat tortillas? Also wondering if you make your own refried beans or use canned? I’m just embarking on the journey of cutting out processed/packaged food. Thank you so much! I make my own tortillas which are super yummy! (http://heavenlyhomemakers.com/totally-tortillas-ebook) I have looked and looked for a healthy store-bought tortilla, but haven’t found one. Homemade tastes a million times better anyway! :) I soak and cook pinto beans to make my own refried beans. I have a similar recipe, but it uses 2 cups of sour cream, 1 cup of cheese and no cream cheese. I will have to try this one. Putting it in a small crock pot works great for keeping it warm – I just mix the cheese in.